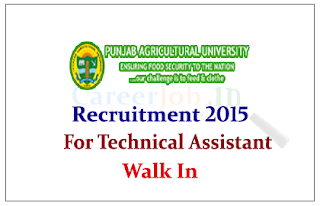 Punjab Agriculture University is recruiting for the post of Senior Technical Assistant for the year of 2015. Eligible candidate can apply here on or before 30th June 2015. The Punjab Agricultural University in Ludhiana, Punjab is one of the State Agricultural Universities in India. Eligible Candidates can send their application with bank draft of Rs.200/- in favour of Comptroller, Punjab Agricultural University, Ludhiana on or before 30.06.2015. For more details kindly check Official Notification.